I’ve just open-sourced my Pick a Number casino game. You can find it on SL Exchange and in-world at Union Micro. The site layout is done, I think. I tried to carry over the WordPress theme into the forums as best as I could. I also installed the attach mod into the forums, so you can attach files to your posts… but this is a feature I installed for me, not the posters. The point of the forum is for people to get information about Union Micro… it’s not really meant to be an active social environment; although I wouldn’t argue! I got rid of the “Download Engine” and started a Downloads forum, I think that will be a little more intuitive. So, now that the meat & potatoes are there, I guess it’s time to start carrying the old news over from the old news system. I plan on adding more features to WordPress and the forums soon. Well I’m going to give this WordPress blog software a try… I’m not sure how good it will work out for this type of site, so hopefully I can customize it to work for me. I was using DMA News, and that was working out great, but then something changed on the server-side configuration and DMA News wouldn’t run anymore. After I get all this setup with navigation menus (other than the stupid defaul blog-y ones), and a Union Micro-ized layou, I’ll be copying the old news over from the DMA News database. Anyway, wish me luck! This brand new HUD attachment is a dream come true for all of the models, actors, and other people in SL who rely on being able to play animations at the click of a button. No more fidgeting with opening animation windows out of your inventory, only to have to re-open them when you choose to stop playing the animation. What’s the difference? The inventory-drop version allows you to simply add animations into the contents folder, and it will automatically load them in alphabetical order. The notecard version allows you to specify which animation shows up in which spot. 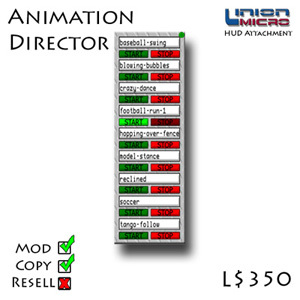 This allows you to sort your animations whichever way you want! 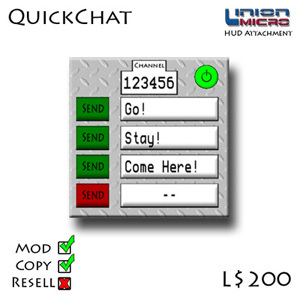 The QuickChat HUD attachment is the essential tool for quick communications. With 4 programmable slots, you can quickly communicate with other QuickChat users at the push of a button. Simply edit the notecard inside, hit the power button, and away you go! All messages are received in format "QuickChat: Owner of talking QuickChat: Message," so there should never be any confusion as to what you are hearing. This is great for anyone that needs to coordinate an event in-sync with other events such as timing a fashion show, directing an in-game movie or playing a fast paced game in-world where typing just isn’t an option. *I disallowed channel 0 to: a)prevent chat spam/abuse, b)to prevent lag. If channel 0 is selected in the notecard, the QuickChat will not start. QuickChat is required by other users to hear your QuickChat text, unless other devices are used to listen on the channel you set. Author Stylez GomezPosted on November 4, 2005 March 26, 2018 Categories UncategorizedLeave a comment on New HUD attachments! We’ve launched a line of small prefabs. These are not meant to be elaborate 1 million prim prefabs, but quite basic with photo-realistic textures. Our first 2 are meant to be used as shops, but are modable to whatever you want to use them as. They are 9 and 13 prims respectively. These 2 products were released almost a week ago, but I’m just getting around to updating the site today. The Union Micro Multi-user Tip Ball will allow you to save your precious prims at your events by allowing you to replace all those tip jars with one of our multi-user tip balls. You simply add all of your hosts into the configuration notecard, and away you go. The host then simply clicks the ball, and answers Yes when asked if they want to take it over. From then on, all money paid into the ball is redirected to them. The Union Micro Multi-user Shouter will enable your event hosts to be heard clearer than ever before. You’re probably wondering what’s preventing your host from just shouting in the first place, aren’t you? Well the main thing is that the hosts text will now show up in green instead of white and blending in with everyone else. The shouter sets its own name to that of the current host, so it looks like that person is talking, but in green! Union Micro is now located in the brand new sim of Pigra! The location is much bigger than the previous one, and is also a lot closer to a telehub. We are nearing the end of basic construction and about to start the construction of the store interior. In the meantime there is a vendor setup so you can still check out our stuff. Click here to check us out!